Scarves can add a touch of coziness and style to your fall outfit. On frigid days, pair a chunky knit with your favorite sweaters and coats. In nice autumn weather, go with a lighter animal print scarf instead. Keep your legs warm with a pair of comfortable flat boots! Whether you go with shorts, skirts, dresses, or jeans, boots add a touch of style to your day. Not everyone will want to wear red lipstick around, but we dare you to try it one day. It will not only brighten up your day, but will look perfect for fall. Extend your summer wardrobe by a season just by pairing your summer dresses, shorts, and skirts with opaque or sweater tights, add a pair of flats or boots, and you'll look polished and warm. Tribal inspired arm bangles will add an interest point to what could be an everyday outfit! Don't miss such an easy way to up your outfit. We're loving the color mustard. While you don't want to overdo it, choose one piece of clothing or one accessory to sport this hue. While bib necklaces may look dressy, they're actually perfect for just glamming up a everyday look. Is it a shirt and jeans day for you? Add a bib necklace and you'll look effortlessly chic. 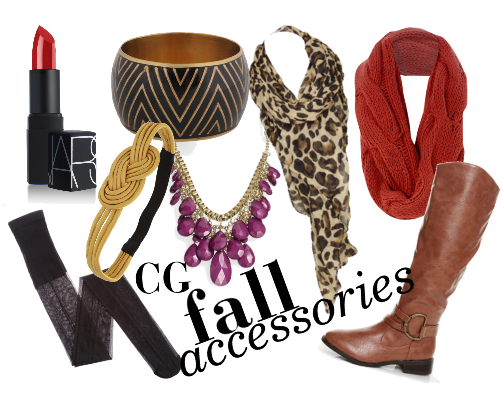 What are your favorite fall accessories? From where is that plum chunky necklace?